Howdy friends, and Happy Hump Day. After hearing about all of the school closures, hopefully y’all are prepared (both physically and emotionally) for the cold. Some of you may like the cold temperatures, but its no joke when an Arctic blast slams into the region. We did have some (very dry) snow overnight, with areas getting between a dusting and 1 inch. 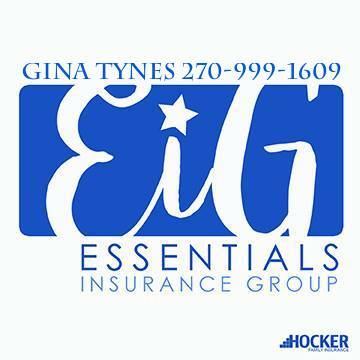 The roads are slick this morning, so please be cautious if traveling. 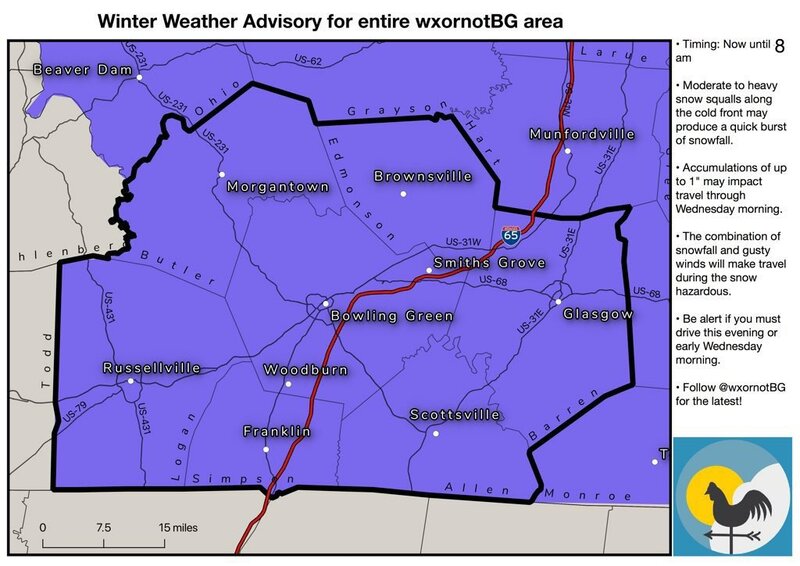 A Winter Weather Advisory will expire at 8 AM this morning. The combination of snowfall and gusty winds will make travel hazardous. Winter Weather Advisory ends at 8 AM today. 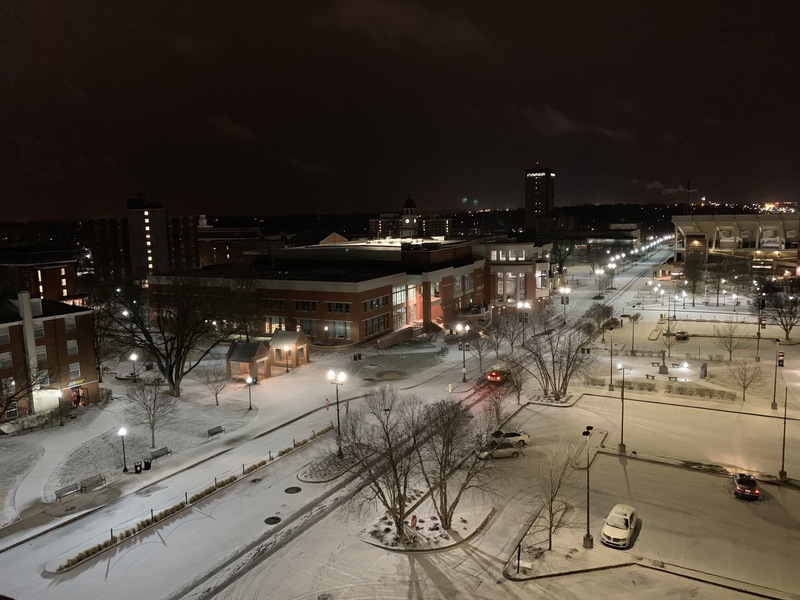 Pictured below is overlooking WKU at 3 AM this morning. Snowfall at WKU at 3 AM. The National Weather Service has issued a Wind Chill Advisory for a portion of our area until 1 PM today. The cold wind chills could cause frostbite on exposed skin in as little as 30 minutes. 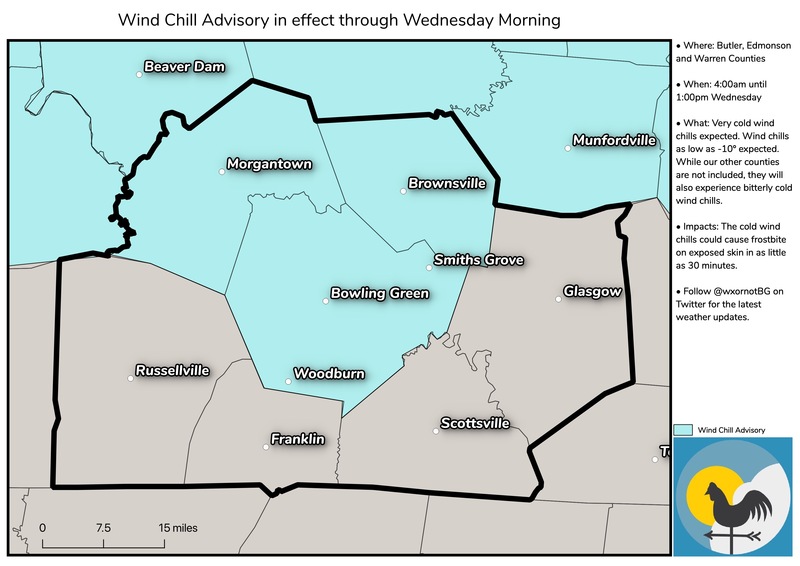 Wind Chill Advisory for Butler, Edmonson, and Warren Counties. If you’re like me and love the warmer months of the year, I’m sorry. This Arctic air will keep our high temperature in the crisp teens, and our low temperature will dip into the single digits. The main concern will be the winds. Strong winds will be coming from the northeast, and are expected to be steady at 10-15 mph, with gusts up to 25 mph possible. 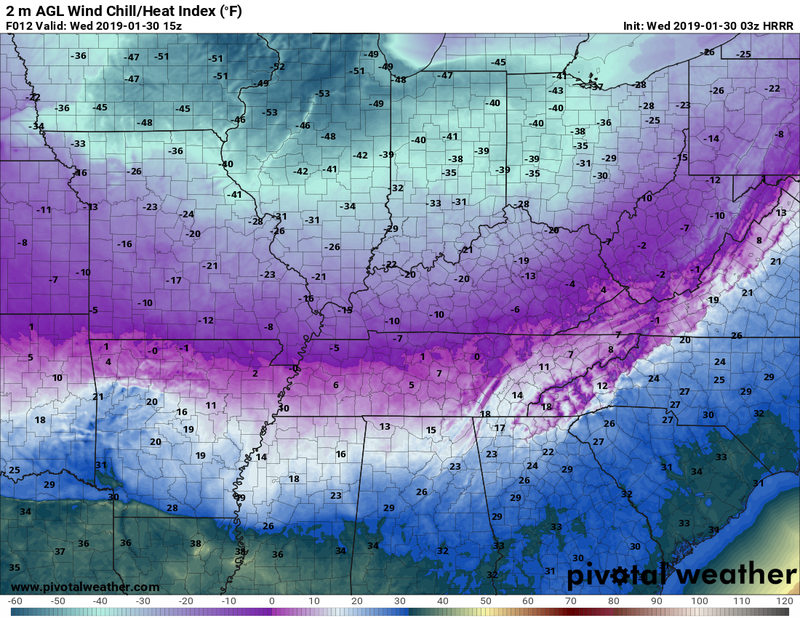 Let’s talk wind chills. The combination of Arctic air and strong winds makes conditions outside dangerous. 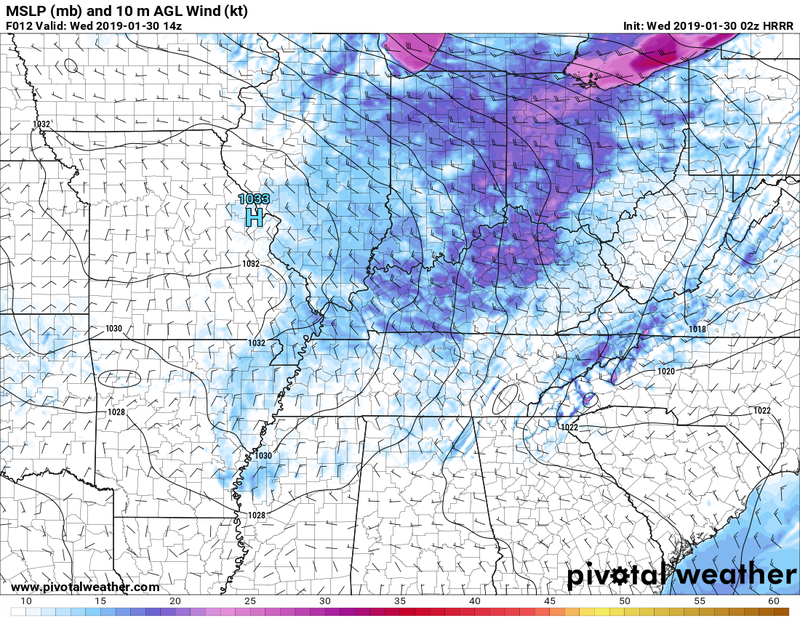 Expect wind chills to be in the -5°F to -10°F range. Negative wind chills are a serious situation. 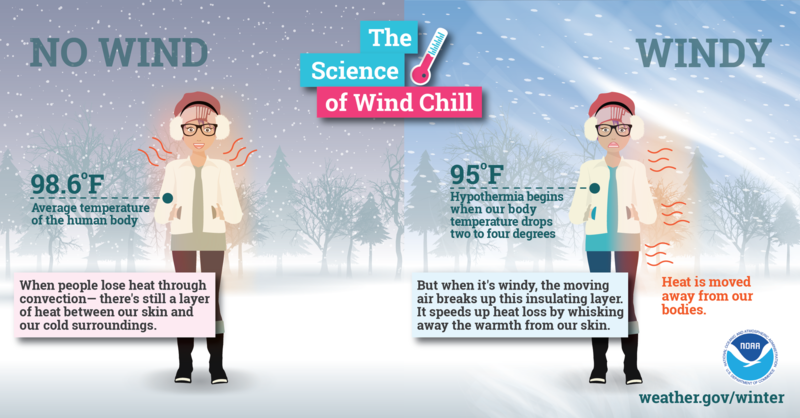 Without a wind-blocking coat and multiple layers, the wind can whisk away the warmth from our skin. With temperatures this cold, frostbite can occur within 30 minutes of exposed skin, so don’t forget gloves, ear muffs, and a face mask to block the bitter wind. Remember, if you’re cold, our furry friends are too! Some snow flurries may linger this morning, but skies should have some clearing by later this afternoon. A chance of some flurries look to return tonight ( 6-11pm), but accumulation should be light (if any). 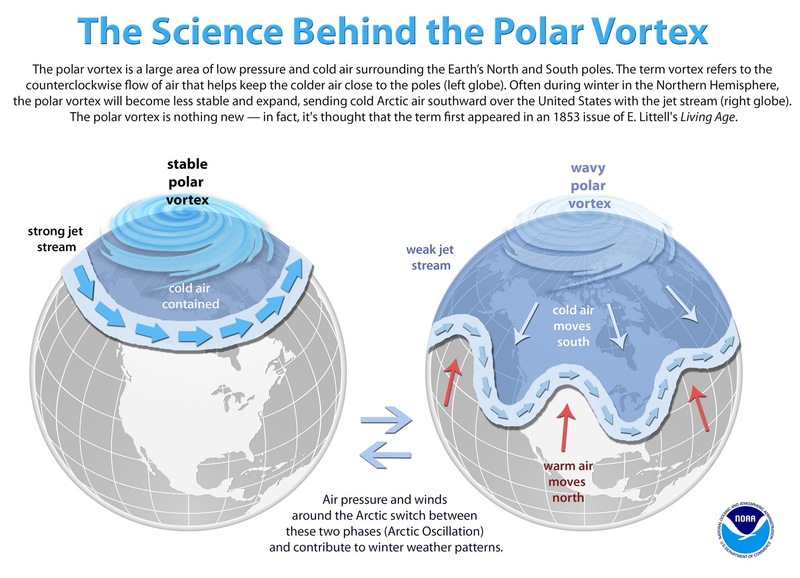 By now I’m sure you’ve heard a lot of talk about the Polar Vortex, but do you know what it is? As seen below, the Polar Vortex is an area of low pressure and cold air at the North and South poles. In the wintertime, it can become less stable and expand, which will send cold Arctic air into the US. If there’s any good news, it’s that temperatures will be “warmer”. 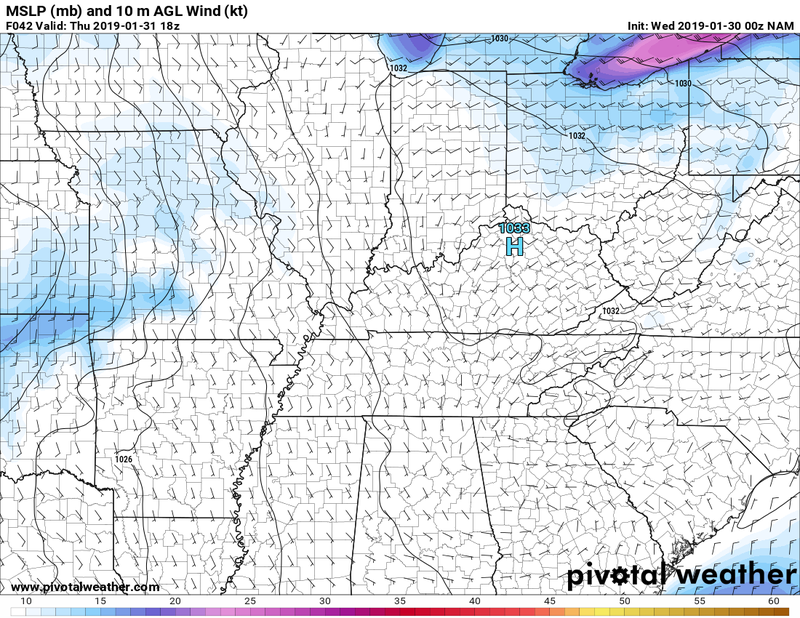 High pressure briefly moves into our area, and winds will be shifting to be out of the southeast. Unlike today, the high temperature for tomorrow will hit the mid 30s, with winds much calmer (5-10 mph). Yes, the mid 30s is still cold, but it’ll be much better than the negative wind chills we have today. Temperatures should stay above freezing heading into Thursday night. A warm front will be pushing into our area, and will bring rain chances beginning around 11 pm. Light rain showers should persist into the afternoon hours on Friday. While the amount of rainfall should stay under 0.25 inches, temperatures will be warmer than Thursday. Expect temperatures to hit the mid 40s in the afternoon (this is exiting!). By Friday evening, rain should exit, but clouds will remain. Low temperatures will bottom out in the mid 30s. If you are excited for the weekend, then check back here tomorrow for information about Saturday’s forecast (Hint: it’s looking really nice).